“The Hours” To Become An Opera? 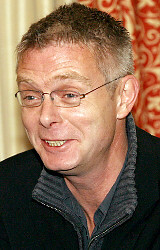 Director Stephen Daldry (pictured) is bringing his cinema-to-stage musical adaptation of “Billy Elliot” to Broadway this fall. But, according to the New York Daily News, next he wants to bring his hit 2002 film “The Hours” — which is based on Michael Cunningham’s luminous novel and which won a Best Actress Oscar for Nicole Kidman — to an even grander stage. “We thought about it as an opera,” he told The News’ Joe Dziemianowicz. Really? “Seriously,” he said. “Scott Rudin, the producer, is very keen on it becoming an opera. I’m serious about it.” Personally, I think “The Hours” could be a beautiful opera, but please don’t ask Philip Glass to write it! His soundtrack for “The Hours” onscreen almost ruined the movie for me. Is Angie Black Enuf To Play Cleo? Is Rooney Mara In The Race Now?